I am no longer a kale virgin! Health never tasted so good. I’m not exactly an organic granola health buff. I believe in everything in moderation, a little cheese, a fresh salad, maybe even a sloppy Joe once in a blue moon. That being said, I am pleased I have gotten over my fear of kale. The sound of it just reminded me of some sort of seaweed. Kale has received much recognition for its health benefits and properties. This super food has 0 fat, that’s right ladies you heard me correctly …zip, zero, nada fat, yet it is high in fiber and low in calories. This fabulous detox food has high amounts of vitamin c, a, and k, as well as calcium and iron. Eating kale on a regular basis lowers cholesterol and acts as an anti inflammatory. I recently was ding alone on a business trip and in between some wine tasting, people watching, and trying out small dishes at Gusto 101 in Toronto. I needed just one more bite before I headed out and was very close to ordering a brick oven pizza, sitting across from the open kitchen was a huge tease. The waitress recommended I try their feature dish the kale salad, a chopped selection of imported kale, apparently it is the best in the city, was topped to my delight with a light house dressing, pine nuts, and fresh parmesan cheese. Not only was it fully satisfying, a couple to the right of me asked to try it also after seeing my salad. I retried making this at home and voila it was almost as good as Gusto 101. 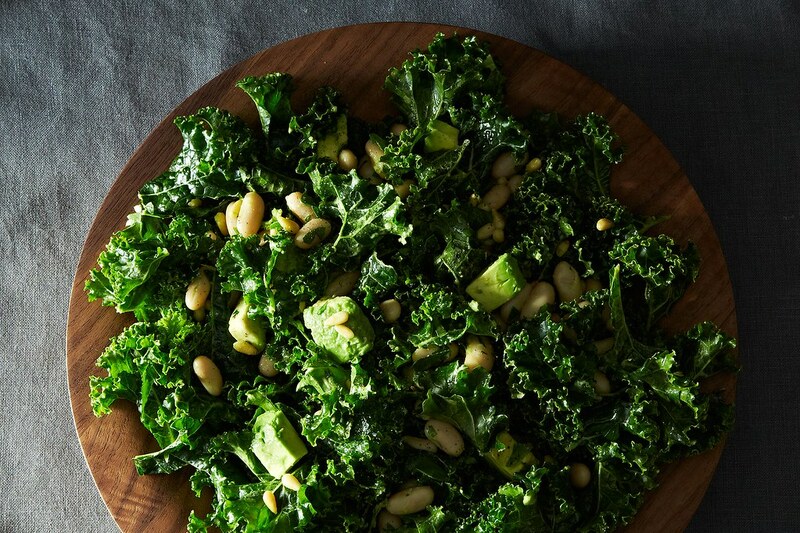 Here’s the 101 on making a great kale salad. First wash the kale and chop it into the tiniest of pieces. Marinate it with fresh lemon juice that will change the texture into a softer edible version of kale. Let this sit for at least 10-15 minutes. I then mixed up some red palm oil with virgin olive oil, lemon juice, and organic honey as a dressing. Top it with salt and pepper, toss in lots of pine nuts, a bit of tomatoes, and fresh parm and you got yourself a delicious treat!